After many years of successful campaigning and many serious scalding injuries later, Thermostatic Mixing Valves (TMV) are now recognised by the UK Government and installers alike as essential valves for bathrooms where water needs to be kept hot to prevent the threat of legionella, yet still delivered at a safe temperature at point of use. TMVs have been used for many years, not just in the domestic environment, but in NHS and care home applications where the duty of care to patients and residents makes such products essential for the supply of safe hot water and as such recognition of the products has grown. The use of TMVs has therefore never been so apparent, some of which is down to the introduction of Part G, section G3 of the Building Regulations. This section relates directly to new build properties and rooms that have been converted from another use into a bathroom. It is now mandatory for TMVs to be fitted in all bath fill applications in new domestic properties. The products used in these applications must comply with BSEN1111:1999 (high pressure) and BSEN1287:1999 (low pressure) standards. The legislation does not cover existing bathrooms or properties; but surely there should be a duty of care to ensure steps are taken to prevent scalding in the bathroom – especially in Special Needs situations. The legislation allows for a highest temperature of 48°C to be set. The actual setting is 46°C with an accuracy of the internal element working at +- 2°C. Comfort settings below this level can be achieved during commissioning. The British Burns Association recommends 37-37.5°C as a comfortable bathing temperature for children and in premises covered by the Care Standards Act 2000, the maximum water outlet temperature is 43°C. Valves must meet the BS7942 standard and the Model Engineering Specification, while independent third party testing and approval through the BuildCert TMV3 Scheme ensures that consistent quality and performance is maintained. Choosing the best possible solution for the job is critical especially where scalding is concerned. 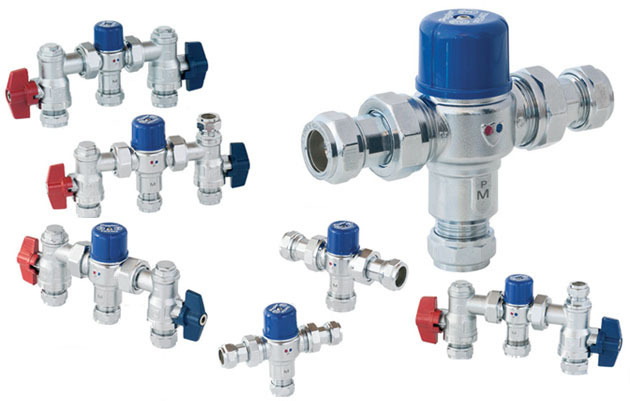 Our Pegler range of in-line Thermostatic Mixing Valves (TMVs) combine high quality manufacture with top-of-the range performance and offer full compliance with all regulations and best practice. Our ability to draw on more than two hundred years of experience combined with unrivalled research and innovation means that when you specifiy a tried and trusted Pegler product you are guaranteeing a job well done! Simplicity of installation and servicing .